It’s Christmas Eve! Hooray! I’m quickly posting this before heading to my parents house for a delicious supper to get us in the mood (and get our stomachs in practice) for Christmas Day! I love Christmas Eve – the anticipation and excitement, wrapping presents, looking forward to seeing family and so on. 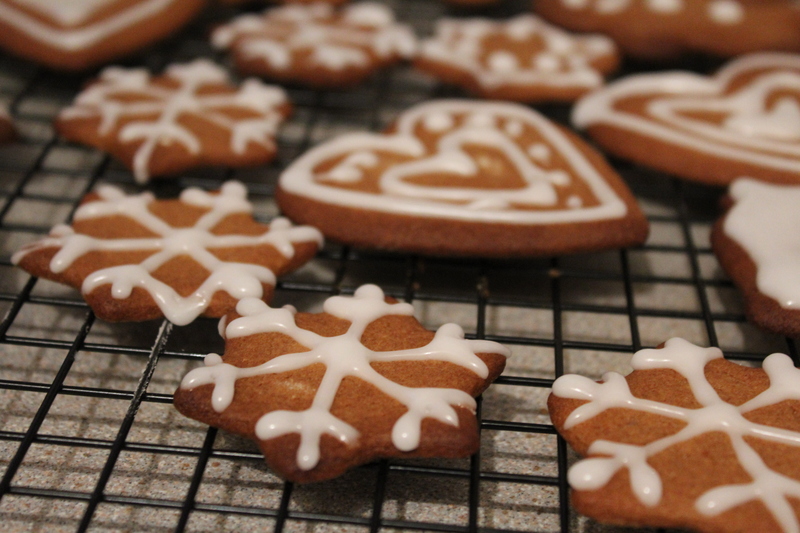 I decided to make some gingerbread biscuits as they’re so Christmassy. The house smelt wonderful as the ginger and cinnamon wafted out of the oven. Delicious. 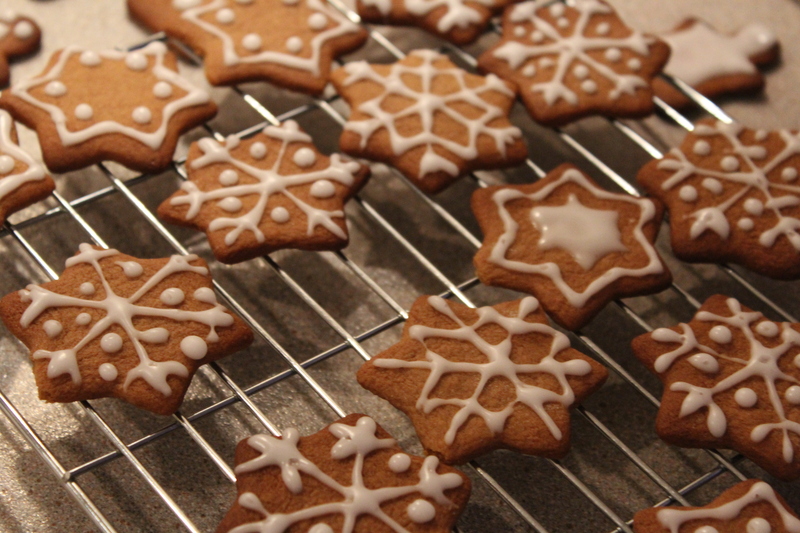 I then spent ages decorating them to make them even more Christmassy. Definitely recommend trying these – so easy to make. Recipe from the Good Food website. Put the sugar, golden syrup and butter in a saucepan. Bring to a simmer, then bubble for 1-2 mins, stirring until well combined. Set aside to cool for 10 mins. Tip the flour, bicarbonate of soda and spices into a large bowl. Add the warm syrup mixture and the egg, stir to bring everything together, then gently knead in the bowl until smooth. The dough will feel a little soft now, but will firm up once cooled. Wrap the dough in cling film and chill for at least 30 mins. Remove the dough from the fridge and and leave at room temperature until softened. Heat oven to 200C/180C fan/gas 6 and line two baking trays with baking parchment. Working with half the dough at a time (keeping the remaining dough well wrapped), roll out to the thickness of a £1 coin. Use cutters of your choice and get cutting! Arrange over the trays and bake for 7-8 mins until a few shades darker and puffed up a little. 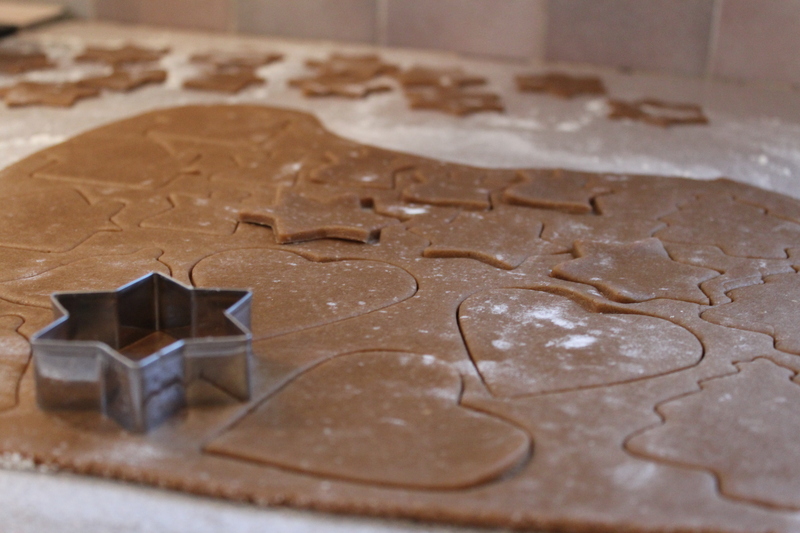 Cook for a few mins longer for large gingerbread men and for only about 6-7 mins for small biscuits. Cool on the trays for 5 mins, then transfer to a wire rack to cool completely. Un-iced, the biscuits will keep in a sealed container for up to 2 weeks. 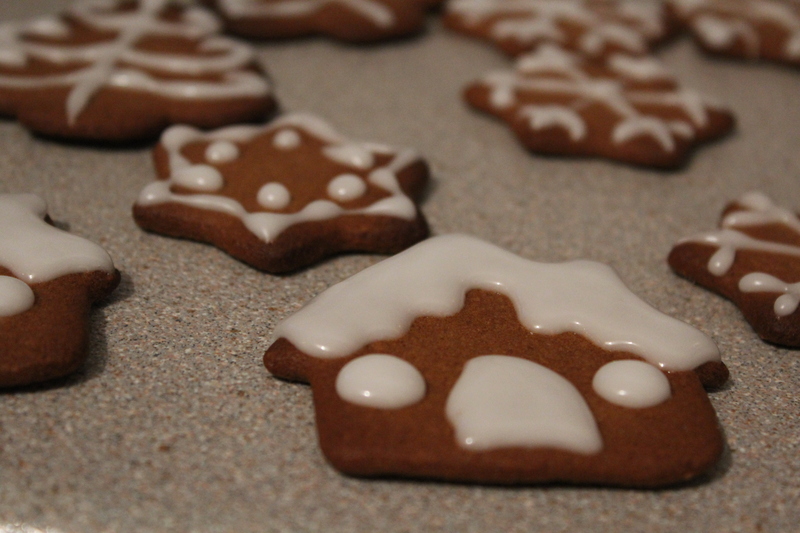 Optional: To decorate, wait till cold, mix the icing sugar with a small amount of water and mix till combined. 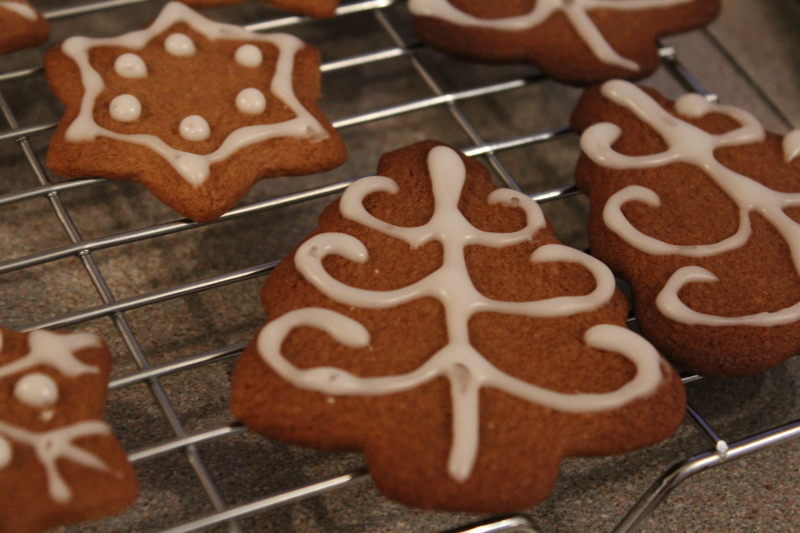 Use a piping bag with a fine nozzle, pipe different patterns on to your biscuits. I didn’t have a fine nozzle (only medium) and it was a bit harder to make things look neater as the icing does spread a little after being piped. Leave to harden up.